With BUILD 2018, Microsoft issued its annual roadmap for developers, positioning ubiquitous computing across multiple platforms as a priority for the company. The company showcased multiple computing innovations that they intend to use for continuing enhancements for our growing computing ecosystem. These days most users have multiple devices, usually with different operating systems such as Windows, Android, and iOS. The work Microsoft is doing in this area is moving towards making this computing experience ubiquitous no matter where you access your data. All these enhancements depend on the cloud as the connective medium through which all computing flows. Suffice it to say that Microsoft has a solid handle on the cloud side of things with Azure. Just look at their quarterly earnings to understand Azure and all its related services continues to grow steadily. These services support the Microsoft Graph and the data it provides, which in turn makes the job of end users in business and enterprise more organized and productive. Between the BUILD keynotes and sessions, there were several new computing innovations which will be key to this increased productivity. Let’s review which ones are likely to impact the enterprise. 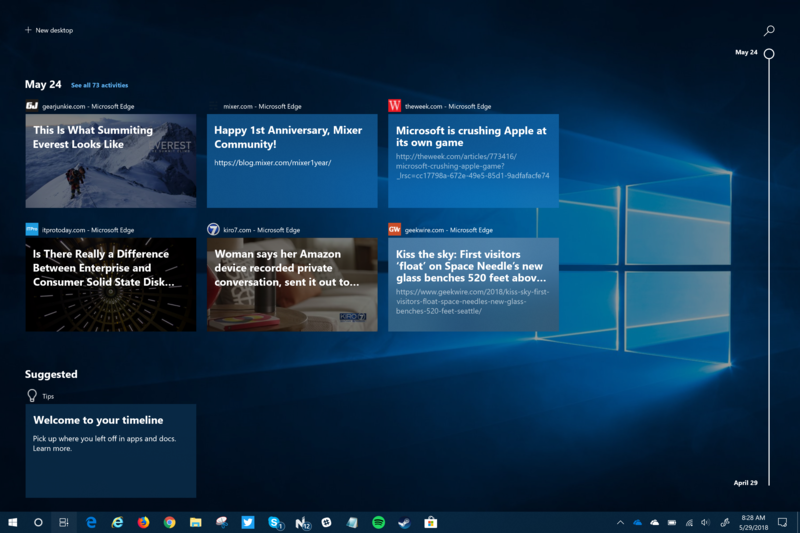 The release of the Windows 10 April 2018 Update last month made this new feature available to everyone as they upgrade to the latest feature update. Timeline extensively relies upon data from the Microsoft Graph to recall your activity, including web browsing, image handling, and document creation. This data is then shared across Windows 10 devices which use the same Active Directory and/or Microsoft Account. Microsoft told developers at BUILD 2018 that they can add Timeline support to their own apps, thus allowing Timeline to share the app data across all devices – pointing back to Microsoft’s aim to make the computing experience ubiquitous and seamless across devices. Timeline is currently only supported on Windows 10 devices running the April 2018 Update. However, support is being extended to Android and iOS devices. This expansion will further expand Microsoft’s vision of people working seamlessly within their computing environment no matter the computing device or operating system. Mobile browsing activity on Android and iOS is already being tested and those activities are being shared into Timeline. A full Timeline experience is expected during the current Redstone 5 development cycle. According to Microsoft, users on Android will access Timeline data through the Microsoft Launcher app while those on iOS will use Microsoft Edge. As more apps begin supporting this feature, it has the potential to boost productivity: No more searching directories looking for a recently accessed/created file or digging around looking for that website that was visited the other day. Just open Timeline and the information will be right there on the screen, organized by date and time over the last 30 days. 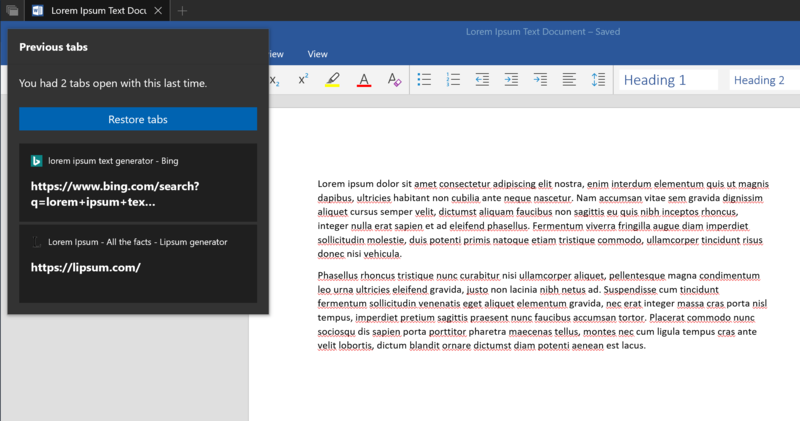 Although OneDrive and SharePoint are great tools for long-term sharing of documents and other files, sometimes you just need to quickly send something to a co-worker. Near Share provides users the ability to share documents, images, and website links to other Windows 10 based devices. It uses a full permissions-based process to send and receive these files between devices. There are also options to share just between devices logged into by the same user or any nearby devices. Right now, Near Share is limited because it only works between Windows 10 devices. However, during the BUILD 2018 session Behind the scenes of the Sets on Windows 10 and Your Phone (BRK2417), I learned this is changing. During a live demo of an app the presenters were building during the session, we saw that Near Share will soon be offered as a sharing option on Android devices. This will greatly expand the functionality of this feature and based on one slide in the presentation, it appears the functionality will be available on iOS devices as well. One caveat on this: just like with Timeline being implemented on both Android and iOS via different apps, Near Share may be limited on iOS because of various lockdowns in the mobile operating system. Developers already have APIs to integrate this capability into their own apps. Microsoft has gone through a few attempts at integrating mobile-centric communication modes like messaging into the desktop environment. 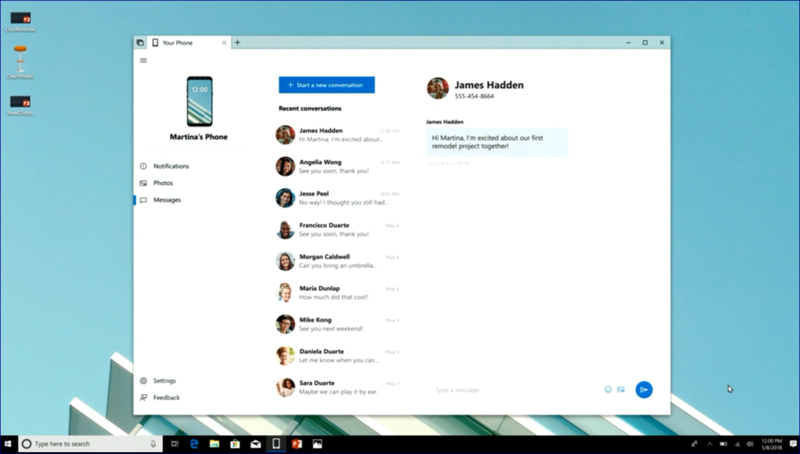 These various attempts have used Cortana, Skype, and even the popular Messaging Everywhere feature. Currently, Cortana can initiate a text message via a paired device and reply to incoming messages via the Action Center on Windows 10. Your Phone is Microsoft’s latest attempt to colonize mobile devices with their own app ecosystem: It will be an inbox app available in Windows 10 right next to Mail and Calendar, Photos, and Paint 3D. The app will have a shortcut available on the Taskbar by default. Launching into this experience will open a window onto a user’s mobile device, thus allowing access to files and messages. Microsoft will use the Microsoft Graph to identify a user’s mobile device and connect the two devices across platforms. Ultimately, the user controls this access though and can turn it off. Unfortunately, due to the previously discussed limitations and differences between Android and iOS, this experience will be more limited on Apple’s mobile devices. As I understand it right now, messaging and notifications will not be available on those devices unless Apple programmatically opens access to those elements. Any organization that wants to take full advantage of an app like Your Phone and its productivity enhancements may want to strongly consider Android-based devices for the end users. Your Phone is expected in a future feature update of Windows 10, so expect testing in the Redstone 5 development branch to begin soon. We first heard about this upcoming feature for Windows 10 at BUILD 2017. It was announced and demoed right alongside of Timeline at that time. Both features were intended for the Fall Creators Update however, neither developed far enough along to be included in that feature update. 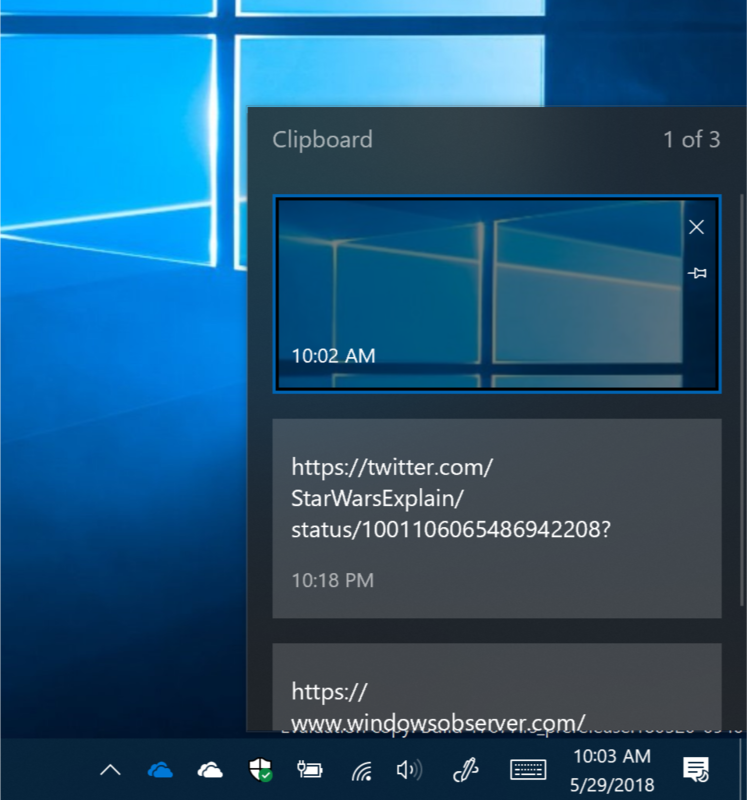 Cloud-Powered Clipboard became available in Windows 10 Redstone 5 Build 17666, a few weeks ago. It implements the ability to share copied content across devices. It is currently limited to text snippets and images less than 1MB in size and is invoked by pressing the WINDOWS + V keyboard shortcut. Microsoft is expected to bring this feature to Android and iOS so that those same snips of text can be accessible across user devices independent of Windows 10. I am grouping these two items together because they offer similar productivity improvements. The Sets feature allows an end user to group together different documents and browser windows together as they work on a project. Rather than having multiple windows open, everything stays within one window but in different tabs. These Sets of tabs are remembered every time a user opens that document; they are offered an opportunity to restore the other tabs that were also opened alongside it. Imagine the productivity boost from not having to pull together all those resources back together. This is a perfect example of an end user picking up where they left off on a project. Developers using the latest SDK for Windows 10 Redstone 5 can already begin making their apps Sets aware so they can be easily integrated into this capability. Interested IT professionals can begin testing Redstone 5 and Sets in their own organization through the Windows Insider Program for Business. 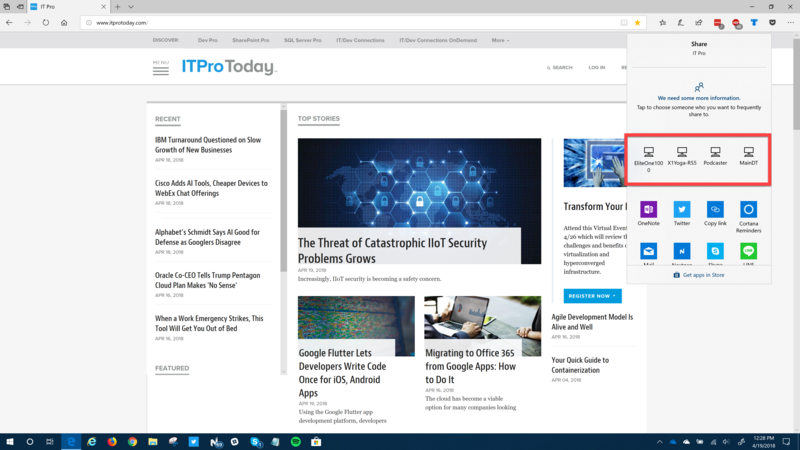 Although Microsoft’s Edge browser continues to play catch up to many of its modern competitors from a usage perspective, that is not stopping the team from implementing new features. A new feature to help those end users who are browser-driven workers is currently in testing. If a user needs to open multiple tabs, then the Set Aside and Restore Tabs feature is improving to allow users to group together different browser tabs in a persistent cluster, name the cluster, then restore it in subsequent web browsing sessions. Consequently, users who rely on using web-based interfaces can now name them according to the tasks they’re doing. 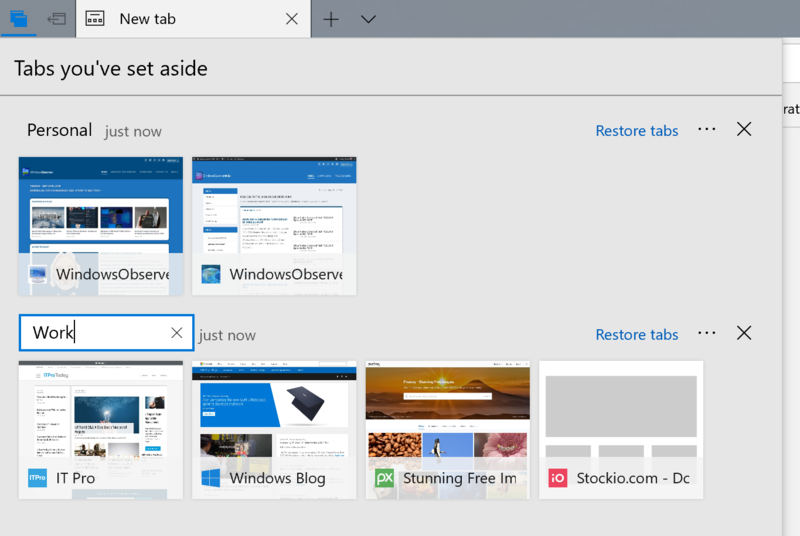 For instance, you would have a Work and Personal collection of tabs and when you restore those tabs all of the corresponding sites would then be opened in Edge for immediate access. Microsoft should allow users to save these groups of tabs to always be available for restoral at any time. Take that one step further down the road and provide system admins the ability to configure default groups of tabs for their users which open key sites for work purposes.